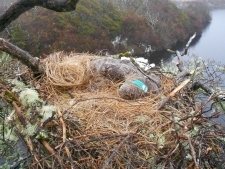 A White-tailed Eagle has been found dead in the nest at a nest site in Connemara. The six year old female eagle was discovered dead in the nest on 1st April by Conservation Ranger Dermot Breen and recovered by a team from the National Parks & Wildlife Service on 2nd April. Subsequent post-mortem at the Regional Veterinary Laboratory in Athlone and toxicology analysis at the State Laboratory, Celbridge revealed the bird had been poisoned. The female White-tailed Eagle was released in Killarney National Park in 2009 as part of a reintroduction programme for the species managed by the Golden Eagle Trust in partnership with the National Parks & Wildlife Service. The female eagle settled in the Roundstone area of Connemara in 2012 where she paired up with a male. In 2014 the pair laid eggs at a nest in a remote site but the eggs failed to hatch chicks successfully. Both birds were on the point of nesting again this year at the same nest when tragedy struck. Indeed the post-mortem found the female to contain two developing eggs, so this female was within a few days of laying eggs. The loss of this breeding female comes as a serious blow to the reintroduction project. White-tailed Eagles reach maturity and begin breeding at about 5 years of age. Seven pairs laid eggs in nests in the wild in 2014, with one nest near Mountshannon, Co. Clare, successfully fledging chicks in 2013 and 2014. It was hoped that the Connemara pair would one of a number of successful nests in Ireland in 2015. The loss of a breeding adult has been found to lead to the desertion of breeding sites with potentially serious implications for the long-term viability of the reintroduced population. This is the 13th confirmed poisoning of a White-tailed Eagle in Ireland since the reintroduction project began in 2007. The use of poisons to control foxes and crows has been banned since 2010 but the illegal use of such substances remains a huge threat to wildlife including birds of prey which consume carrion (dead animals).Over the five years of the release phase of the project 100 young eagles were collected from nests in Norway and released in Killarney National Park, Co. Kerry. Thirty one of the released eagles have since been recovered dead with illegal poisoning by far and away the greatest threat to the recovery of this once native eagle to Ireland. Despite these losses the number of pairs in the wild rose to 14 in 2014 with most birds now mature enough to breed. “Although all losses impact the project, the loss of this female is very difficult to take” said Dr, Allan Mee, Project Manager with the Golden Eagle Trust. “She and her mate had been resident in Connemara for the last four years and it was only a matter of times before they produced chicks. It is likely the nest site they chose had been used by White-tailed Eagles in historical times, so losing this pair is devastating. Although the male may remain on his territory for some time, to date we have found that the loss of a breeding adult results in birds deserting the area and remaining some years before they find a mate again. The female’s mate is one of our satellite tagged eagles (male Star) who has travelled the length and breadth of Ireland several times before settling in Connemara. It’s tragic to see him lose his mate just on the point of nesting”. “Over the years we have endured too many losses to illegal and indiscriminate poisoning. We have tried to address this by raising awareness both of the law and the threat posed by poisons to wildlife and farm dogs. While we believe our awareness efforts have been productive it is clear that some individuals are still resorting to using poisons on meat baits such as dead livestock. While their target may be foxes and crows we know to our cost the devastation this causes to our rare and protected birds of prey. We have to continue to get the word out there that this practice is no longer acceptable. We hope that all farmers and farming organisations will rightly condemn this practice which has no place in today’s supposedly more enlightened environment”. The White-tailed Eagle, Golden Eagle, and Red Kite Reintroduction Projects in the Republic of Ireland are managed by the Golden Eagle Trust in partnership with the National Parks & Wildlife Service of the Department of the Environment, Heritage and Local Government in the Republic of Ireland. · Releases of birds have taken place every year for five years (2007-2011) in Killarney National Park, Co. Kerry. In August 2011 the final cohort of 23 birds were released bringing the number released to 100 over the five year release phase of the programme. · Dependent on maintaining survivorship within parameters derived from the reintroduced Scottish population this number should be sufficient to re-establish a viable self-sustaining breeding population in Ireland. · As Sea Eagles breed at about five years old it was expected that the first Irish nesting attempts would be in 2012/2013. In 2012 the first nesting attempt occurred in Co. Clare, the first breeding in the wild in over 100 years. · In 2013, the first wild-bred chicks fledged successfully from a nest in Co. Clare with a further successful chick fledged in Clare in 2014. The number of adult pairs has increased steadily from one in 2010 to 14 in 2014. Ardpatrick, Kilmallock, Co Limerick, Ireland. Or search for Golden Eagle Trust after logging into your Facebook account.